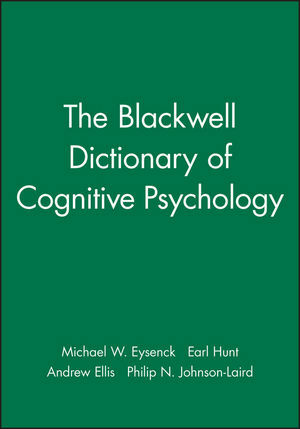 The Blackwell Dictionary of Cognitive Psychology, now available in paperback, provides a comprehensive and in-depth account of the discipline, in 140 alphabetically arranged entries. Entries, written by specialists in each field, are encyclopedic in style and written at considerable length to cover most of the more important areas to which cognitive psychology has made a major contribution. Subject areas dealth with include decision making, developmental psychology, emotion, intelligence, language, personality, and social psychology. All entries include suggestions for further reading, and the Dictionary has a comprehensive index. The ways in which the cognitive approach has revolutionized applied psychology are also discussed. Michael W. Eysenck is Professor and Head of Department of Psychology, Royal Holloway and Bedford New College, University of London, and formerly Reader in Psychology, Birbeck College, London. Andrew Ellis is Professor and Head of Department of Psychology, University of York. Earl Hunt is Professor of Psychology at the University of Washington. Philip Johnson-Laird is Professor of Psychology at Princeton University.